The Jawaharlal Nehru Technological University Hyderabad (JNTUH) has been declared the B.Tech and B.Pharmacy First year R15 supply results. The university announced this result update today on September 27, 2016. The candidates those who all appeared in this exam were eagerly waiting for their result. Here, it is an official announcement by the University. So, students can check their results through the official website of the university. Follow the guideline to get the results. The JNTUH is located in Kukatpally and the university had the ‘A’ Grade National Assessment and Accreditation Council (NAAC). The university controlled various Engineering colleges using the name of NTU, and JNTU. The Official result website provided the two result servers to control the rush of the visiters. Kindly visit the official website OR click the above give link. 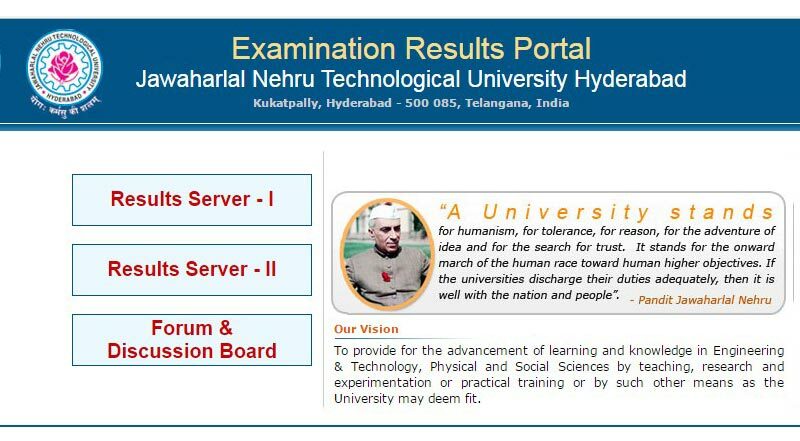 The www.jntuh.ac.in will guide you to the result page. Now, the user needs to select the Result Server. As previously mentioned that the official website had provided the two servers for the result page. After selecting the server, the user needs to choose the exam stream. The B.Tech result link will have appeared as First and the B.Pharmacy result will have appeared as a Second link. Now, the candidates want to fill the required details as hall ticket number, date of birth and the verification code. Click “Get Result” tab and get the result page. Because of the heavy traffic, the website server is down at this moment. So, the students are requested to wait for an hour or more and then check the results without any server crash.